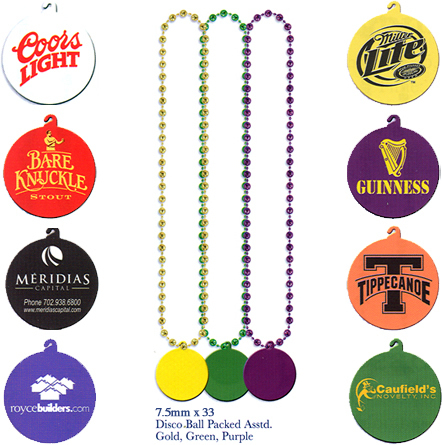 Colorful and festive, our Custom Imprinted Mardi Gras Medallions are a must-have for any "Fat Tuesday" Celebration. You can custom print these medallions on one or two sides, with one to four colors. Several medallion and necklace sizes, colors, and styles are available. Ordering from us is easy: call 1-800-233-0828! We also offer a wide selection of other Holiday Decorations, Including St.Patrick's Day Decorations, Oktoberfest Decorations, New Year's Decorations, and More!